Call Oprah "Miss Cleo," because she warned Raven-Symoné that Twitter was not going to take too kindly to Raven-Symoné's preference to be considered "an American" and not an "African American." "She told me that black Twitter is going to hate me forever," Raven-Symoné revealed during an interview with US Weekly. "She was right," Raven-Symoné said, laughing. "I love you, Oprah." That's not the only issue that pitted the actress—and newly appointed co-host at The View—against black Twitter users. In March, some people felt that Raven-Symoné was defending a disparaging comment that first lady Michelle Obama looked like an ape. 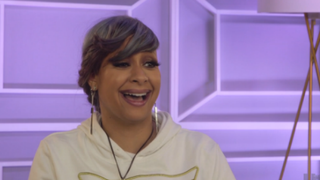 When asked by Essence Live if she feels that black Twitter is still upset with her about some of her views on race and other cultural issues, Raven-Symoné spoke as if she didn't even have time to entertain the wrath of black Twitter. "I don't even pay attention," Raven-Symoné said. "Somebody else told me that they were mad. I don't read it." Raven-Symoné feels that she's entitled to her opinions and shouldn't be made to feel bad about them. "I only speak for myself. Only for myself. I'm sorry that you're mad about how I feel," she said.